In 2005, when Peer to Peer lending was conceived, investors would make unsecured loans to consumers. The founding fathers of the industry - Zopa, Lending Club and Prosper - exclusively originated consumer loans in their early years. It was not until mid 2010, when Funding Circle launched, that there was the opportunity to lend to business. As the sector has matured further, secured lending has come to make up a large proportion of originated loans in the UK. The most common security for these loans, by a significant distance, is property. As we reported last month, 2015 saw total UK alternative finance origination volumes grow 75.7% year on year. Within this, the fastest growing segment was loans secured against property with this segment delivering 96% year on year growth. Figure 1: Peer to peer and marketplace lending monthly origination segmented by borrower type. Figure 1 clearly illustrates the growth of the property sector, shown in green, over the past 3 years. It is also clear that the property secured lending has grown quicker than either consumer lending or business lending. 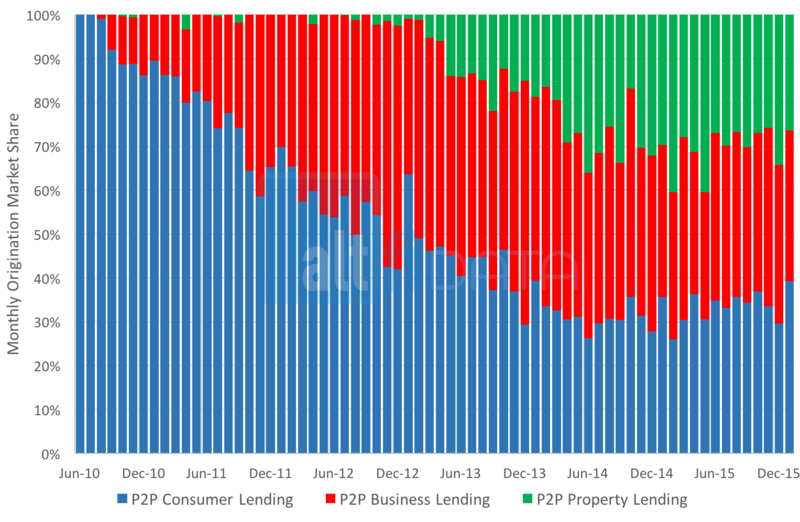 Figure 2 shows that towards the end of 2015 the growth of the secured property lending sector relative to the industry appears to have stabilised with an approximate 25% market share. Figure 2: Monthly origination market share segmented by borrower type. Peer to peer property secured lending takes several forms – development loans, bridging loans, buy to let loans and loans to businesses secured on the business’ property. Each of these have different risk profiles, however they all share the commonality of being backed by bricks and mortar. It is not just origination volume that is growing rapidly in this segment - the number of participants is increasing faster than elsewhere too. 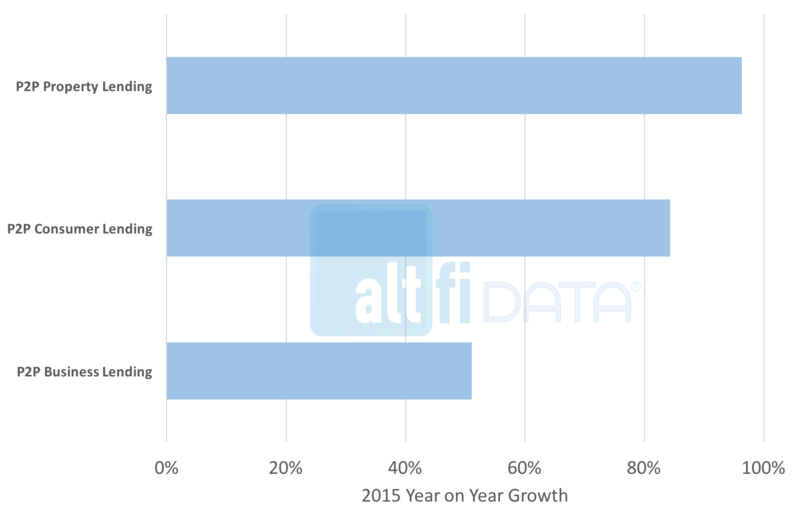 The number of platforms in the AltFi Liberum Volume Index that originate property secured loans grew from 8 at the end of 2014 to 11 at the end of 2015 – 38%. Whilst the number of platforms in the overall index grew from 20 to 25 – 25%. •Funding Secure started lending as a peer to peer pawn broker, lending against assets such as jewellery and fine art. It now also lends against plots of land and property. •Saving Stream cut its teeth lending against boats and fast cars and now the majority of the loans that it originates are secured against property. •Invest & Fund, a platform that started out as a local unsecured SME lender is now doing more and more property backed lending. •Funding Circle is doing increasing amounts of property backed lending - 22% of its origination was property secured in 2015 vs 10% in 2014. •17% of RateSetter's cumulative origination since launch has been secured on property, with the first loans being made in May 2013. What is driving this trend? Platforms wishing to diversify their borrower base? Certainly. But why property secured lending in particular? Anecdotally, property backed lending is an area to which the UK’s banks have massive exposure and it is well known that the banks are trying to manage this exposure. The area is therefore underserved and there is plenty of low hanging fruit for alternative lenders to harvest. This low hanging fruit represents an attractive revenue opportunity. The average size of a peer to peer property loan is some 4.5x larger than that of the average SME loan and a whopping 65x greater than the average consumer loan. See figure 4 below. Figure 4: Average size of Peer to Peer loans by borrower type. 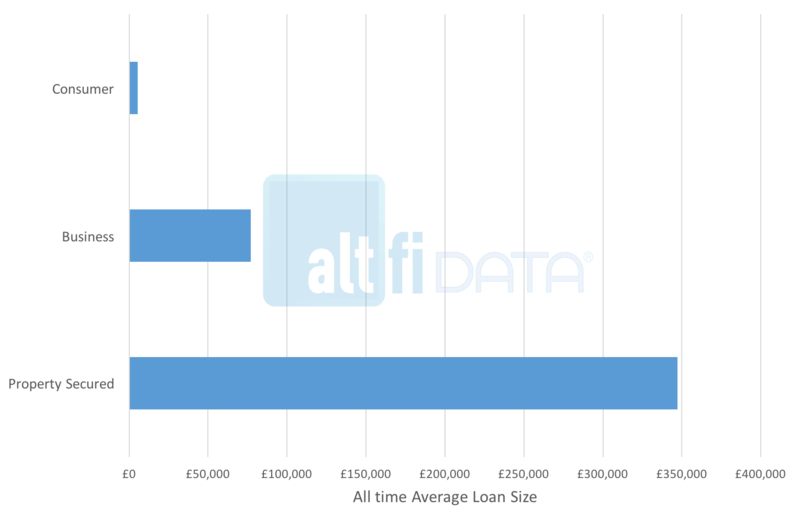 The cost associated with the sourcing and origination of a £350k property secured loan is not commensurately greater than that required to source, say, a £75k unsecured loan to an SME and yet the fees that a platform can charge are a similar percentage of the loan amount. Property loans would therefore appear to be more profitable for originators. It may also be that buoyant investor demand for property exposure is another factor in the growth of this segment. The perception that property backed lending is low risk is part of the British psyche. However, house price falls or property lending have been at the epicenter of the last two UK recessions. With rental yields at near all time lows, UK REITs down 20% since the beginning of the year and a property market that has, in recent years, been fueled by foreign investment from commodity led countries. Can the property market be considered as being “Safe as houses”? Experienced property market participants always emphasise that specialist knowledge of the sector is critically important. This expertise shows through most clearly in any downturn. Aside from considerations about whether property secured lending is the right investment at the moment, how should investors feel about a platform that has ‘pivoted’ into lending against property from lending against jewellery or fast cars or unsecured SME loans? Surely there are pitfalls to property lending that means that a degree of expertise and experience is required to get it right? “Our team has over 100 years’ worth of experience when it comes to property lending transactions. Each loan enquiry that comes to us has to pass through several layers of stringent assessment, based on strict criteria. We have dedicated, employed property loan origination professionals who source lending opportunities in their specific geographical location. This regional expertise gives us a first filter for new loans. The loan originator prepares a preliminary case file for underwriting sign off which, if received, allows the case to be passed to our internal credit team, who review and undertake further due diligence including credit checks on the borrower and associated parties – for example, directors of the borrowing company. The credit team also validate all projected project costing with external quantity surveyors, whilst the expected sale price of the property is also independently validated. “Platforms will definitely come unstuck by moving into the property sector if mortgage loans are not their core expertise. At LendInvest, we started life as an offline mortgage lender in 2008 and only after five years did we launch our marketplace platform. The fact that we were property lenders who learnt the technology has been the key to getting it right so far. Lending money can be easy, but lending it well is much harder. Successful lending is about being able to make informed decisions that are based on years of experience and knowledge of the market you are lending into. This is all the more relevant to the property world where you're not just making an assessment of the borrower, their creditworthiness and their ability to repay. You need expertise too of how to assess the suitability and risk profile of the property you're lending against - sometimes in cases where it's not even been built yet. “As illustrated by the wide range of rates on offer, there is equally a wide range of risks in peer-to-peer. While secured lending provides an element of cushion there is a marked difference between the products on offer, for example, from residential mortgages to short term development finance. It is therefore key that any investor looks further than the rate on offer and educates themselves on the risk profile attached to each platform and investment product so they can be compensated for the risk that they as a lender are taking. It is therefore crucial that lenders know the rate that the borrower is actually paying. Property secured loans now make up 25% of the UK’s peer to peer and marketplace origination, giving investors the option to diversify their lending portfolios. Property secured loans can offer attractive interest rates and the "bricks and mortar" security that backs them seems to give lenders more peace of mind. With all forms of peer to peer lending, it is important that investors make themselves familiar with the platform’s underwriting process before committing capital. Given that the attractions of this space seems to have lured in a number of new participants the need to due diligence processes might prove to be particularly important.